Taylor is serious. She wants you to enter to win these fabulous treats! Happy Holidays! 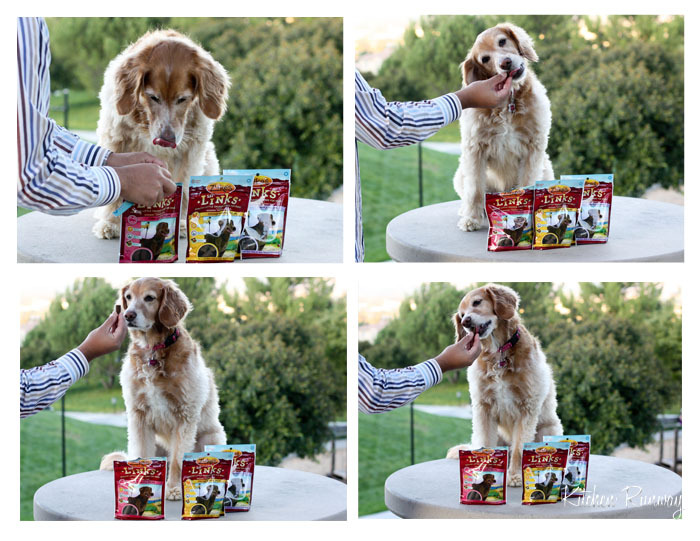 Taylor would like to share one of her new favorite treats with you, Zuke’s Lil Links! They’re little sausage shaped treats that are grain free and are packed with antioxidants. Lil Links come in three flavors: Chicken & Apple, Pork & Apple and Rabbit & Apple. Taylor loves them all. They’re soft treats that are the perfect size for this golden retriever mix. These treats are a healthier option for your dog because there are no by-product meals, artificial colors, flavors or added animal fat. You can learn more about Zuke’s from our previous post and giveaway. Zuke’s is an American company based in Colorado and a portion of the sales are donated in memory of Zuke, the owner’s dog, to the Dog & Cat Cancer Fund. I love that a portion goes back to help dogs and cats in need. Taylor really enjoys these lil links! One lucky reader will win three (3) 6 oz. bags of Zuke’s Lil Links (chicken & apple, pork & apple and rabbit & apple), a $24.00 value. These will be a great stocking stuffer for your furry baby. Congratulations Olivia Rubin ! 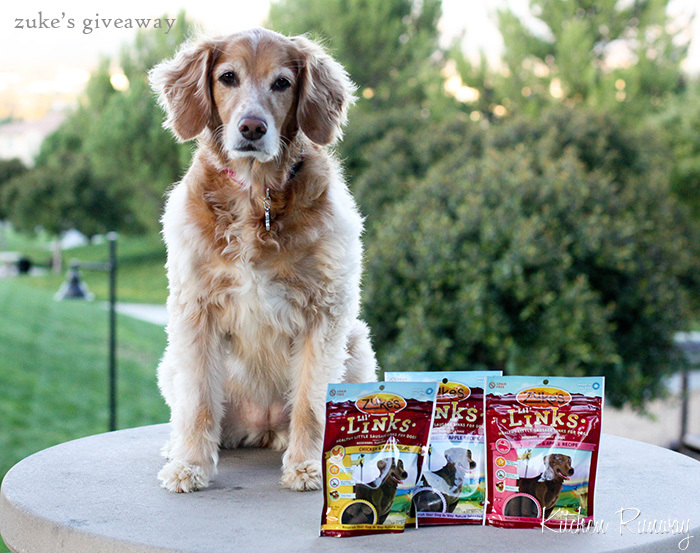 You are the winner for the Zuke’s Lil’ Links Dog Treats! I hope your pup enjoys them and Happy Holidays!! 1. Leave a comment telling us what’s your dog’s favorite holiday treat. This giveaway is open to US residents only and will end on Thursday, December 13th, 2012 at 11:59 pm PST. The winner will be randomly drawn by random.org and will be notified by the email that they provide on the comment. If the winner does not claim their prize by 11:59 pm PST by December 16th, 2012, another winner will be chosen and the prize will be forfeited. Disclaimer: I was sent a complimentary box of Zuke’s Lil Links treats. One random winner will also receive the same. No compensation was received for this post or review. Affiliated links are included in the post. The opinions are my own. This entry was posted in Giveaway, Taylor Thursday and tagged giveaway, Taylor Thursday. tweeted about the giveaway too. A good ole ham bone! aweeeeeee. your sweet old guy remembered me of mine and i wanted to give him a hug i’m at work and he is at the apartment. :(((( wish i followed, or liked or twitted so i could get extra entries because my guy could sure you these – but i don’t …. our favorite holiday treat is probably dehydrated salmon. om nom nom. we follow zuke’s on twitter. 4. I liked Zuke’s on FB! I liked Kitchen Runway on FB. I follow Zukes on twitter (@bakingboyz). I’m a fan of Zuke’s on Facebook. Ohh I would sure love to win this!! I like Kitchen Runway on fb. I like Zuke’s Performance Pet Nutrition on fb. He loves his apple treats during the holiday… although Ive never seen him turn down any kind of treat. If you make him chase you for it every treat becomes his favorite. My dog loves chicken or turkey for the holidays. My dogs’ favorite treat is venison! Her favorite Zukes treats are the z ridge bones…human food rotissere chicken skinoff with a piece of sweet potato! I like Kitchen Runway on Facebook! We love Taylor & her give aways!